It's Suffrage Day in NZ but here in Barcelona it's still the day before. I want to mark it with a post related to what I saw in Vienna. Gustav Klimt had a long relationship (no one knows if it was sexual or not, but it seems likely it wasn't) with a remarkable woman, Emilie Louise Flöge. 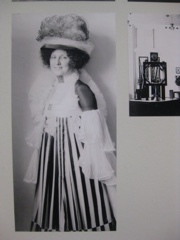 Emilie and her sister Pauline ran Vienna's leading haute couture salon. They included loose, flowing dresses in the Secession style worn by many women in Klimt's paintings. The one below is of Emilie, and the second photo of her shows her in feminist reform dress. (Sorry the pictures here are too small, Blogger on iPad won't let me enlarge them - I'll fix it when I get home.). The shop had to close after the Nazis removed most of the sisters' wealthy customers. The other sister, Helene, was married to Klimt's brother. 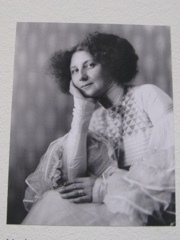 The Leopold Museum has a touching display of Klimt's postcards to Emilie over many years. 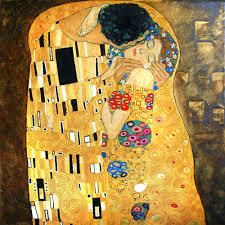 "The Kiss" is said to show her and Klimt - which would explain the woman's apparent reluctance to be kissed at all.